Photo: Courtesy Twentieth Century Fox Corp. -TM and © 2014 Twentieth Century Fox Film Corporation. All Rights Reserved. Not for sale or duplication. Exodus: Gods and Kings is full of all the breathtaking, terrifying spectacle you might expect from veteran film maker Ridley Scott taking on the Biblical story of Moses and the Exodus of the Hebrews from Egypt. His almost infallible sense of grandeur and scope is on full display throughout the film as the various battles, plagues, and miracles unfold in ways never seen before in live action depictions of the story. Unfortunately, there’s not much more to the film than all that technical wizardry and eye-popping spectacle. In terms of the actual story told on-screen, Scott and his creative cohorts bring relatively little new to the table, and so after a while the whole production feels as though its plodding from one obligatory plot beat to the next. There’s nothing bold or innovative in Scott’s take on the tale, and so in spite of how wondrous and beautiful it all looks, it never really escapes the whole “been-there, done that” feeling. 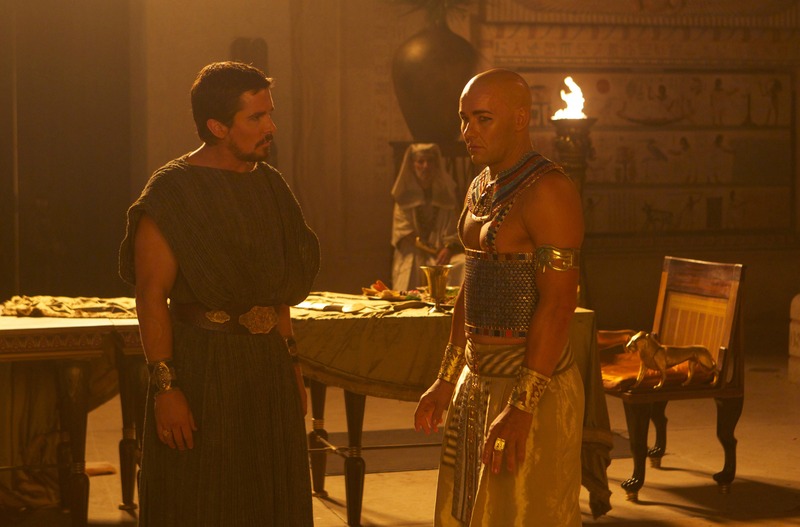 The starting point for the story is a bit different, with the adult Moses (Christian Bale) already a prince and frequent companion of Ramses (Joel Edgerton). Brave in battle, wise and tempered in his counsel to Ramses and to his Pharoah, Seti (John Turturro), Moses would be Pharoah’s choice to be his heir over the impetuous and short-sighted Ramses were they of the same blood. That trust leads Seti to send Moses on his behalf to deal with potential sedition among the Hebrew slaves building Egypt’s many architectural wonders. It is there, during his meetings with the Hebrews and their elder, Nun (Ben Kingsley), that Moses first hears of his supposed true origins, that he is, in fact, Hebrew, and that he was born to lead the Hebrews out of their servitude and to freedom in a land promised to them by God. That revelation is, of course, the beginning of the end of Moses’s life as a prince, and sets in motion his journey into exile, his rebirth and second life as a simple shepherd, and his having to leave that second life, and with it his wife Zipporah (Maria Valverde) and his son Gershom, in order to return to Egypt and lead the Hebrews in their fight for freedom. He trains the Hebrews and engages them in a war of attrition with Ramses’s regime, hoping to pressure his onetime brother-in-arms to release them from their service, but his tactics prove less than effective against the Pharoah’s obstinance. it’s then that the real horrors begin, as the power guiding Moses decides that his people have suffered enough, and its time for the Egyptians and their leaders to learn the meaning of true power. In all fairness, screenwriters Adam Cooper, Bill Collage, Jeffrey Caine, and Steven Zaillian do provide some interesting moments of genuine humanity amidst all the stupendous ancient world sights, terrifying plagues, and parting seas. In particular, Ramses is given some emotional complexity in his relationships with his own wife and child, and with Moses as well, who he both loves as a brother and envies for the favor Moses enjoyed as they grew up together. Also, Moses’s courtship and marriage to Zipporah is brought to life with a grounded charm and grace. As performers, Bale and Valverde have terrific chemistry, and thus their parting and eventual reunion carries with it just as much emotional weight as anything else that goes on in the film. But its clear that Scott, who has brought to life Ancient Rome and Jerusalem in the Middle Ages in his previous epics, has more interest in giving the sights, sounds, and conflicts of Egypt in 1300 B.C. the same treatment than he is in letting quiet scenes and characterization carry the film. 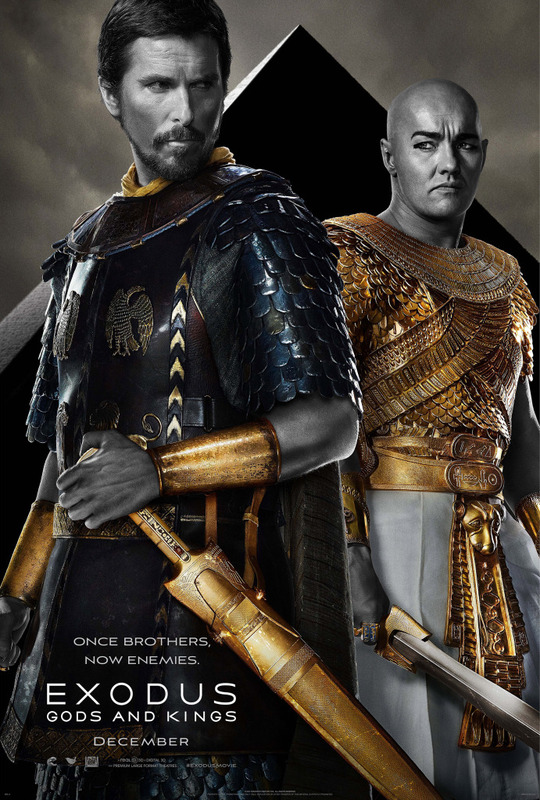 From his grand staging of the Egyptians battling the Hittites at Kadesh, one of antiquity’s largest recorded battles, to the horrors of each of the ten plagues that take hold of Ramses’s capitol city of Memphis, to the Exodus itself, and its climax as the Hebrews cross the Red Sea, Scott delivers one jaw-dropping visual after the next, as anyone who knows his work might expect him to. Production design, costumes, and special effects all are precisely as they should be in a Scott Free Production: meticulous, cleverly conceived, and awe-inspiring in every frame. It’s just too bad there’s not enough creativity in the story being told in the midst of all those cinematic wonders to make it all worthwhile. The production also suffers from some very curious and some cases laughable casting. As well cast as Bale and Valverde are, John Turturro and Sigourney Weaver could possibly be the oddest royal pairing ever seen in a film like this — it really is tough not to see them in all that heavy makeup and the trappings of Egyptian royalty and not snicker a bit, because they look silly. And Edgerton, who we last saw play the heavy in The Great Gatsby last summer, gives his all here but never is fully believable in the role. He comes off as more petulant than arrogant, more pigheaded than divinely entitled. Put it this way: he’s no Yul Brynner … not even close. And perhaps that’s what dooms this effort more than anything else. Comparisons to The Ten Commandments, Dreamworks’ The Prince of Egypt, and other cinematic adaptations of the Exodus story are inevitable, and in comparison, even with all the amazing production design and all those special effects that Exodus: Gods and Kings has to offer, this has all be done before, and done better. Starring Christian Bale, Joel Edgerton, John Turturro, Aaron Paul, Ben Mendelsohn, Sigourney Weaver, and Ben Kingsley. Directed by Ridley Scott. Rated PG-13 for violence including battle sequences and intense images.